In this superbly researched assessment of our literature and its landscape, Suzanne Falkiner takes us on an absorbing journey into the ‘fictional megacontinent’ of the Australian imagination. Drawing us into the visions of Australian writers past and present, she invites us to share her insights and responses to the mystery of this perplexing continent. 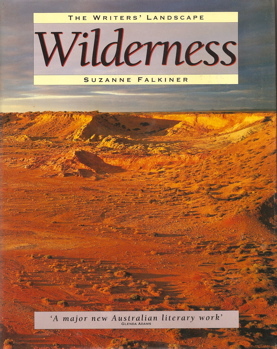 The Writers’ Landscape is Suzanne Falkiner’s unique contribution to the emotional mapping of the Australian experience. Back in the 1940, writers were preoccupied with time, real and imaginary. In the nineties we are concerned above all with reading space within the Australia we have imaginatively created. Suzanne Falkiner has mapped this space for us in fascinating detail: her appetite for textual Australia is boundless. ‘Suzanne Falkiner’s Wilderness is a garden of delights. This is one of the most imaginative, innovative and useful books on Australian literary culture to emerge for some time. [Settlement] is stylish book, rich with illustration…a unique way to an understanding of Australia’s capital cities-historically, culturally and geographically…it offers an alternative approach to our history in terms of landscape and literature. His eyes, however, had seen into unaccustomed depths. Then he threw up a little pebble, which had been changing colour in his hand, turning from pale lavender to purple, and caught it before it reached the sun. THE PREFACE to this ‘blurred map of landscapes still unmapped’ is introduced by a series of rhetorical questions, posed in 1934 in Christina Stead’s novel Seven Poor Men of Sydney. It is given to her character Kol Blount, a crippled youth, to voice certain philosophical concerns while a group of friends entertain themselves in the gardens of an insane asylum by telling stories. Why are we here? Why and how do we carry with us the vestiges of our older civilisations as we attempt to work out our destiny? Why is it that this land, with its ‘malign and bitter genius’ protected by such formidable expanses of ocean, was the last discovered by the European colonial powers, and what are the consequences of this? That which the novelist Stead describes as a ‘bitter dilemma’: the conundrum of a land that showers riches on humanity while denying it the basic sustenance of water; and which in 1965 the poet Judith Wright termed its ‘double aspect’, the conflicting themes of freedom and exile, have exercised the imagination of many Australian writers since the first words were written in Australia. What importance Stead might have continued to attach to her metaphor is, after her death, uncertain, but the the questions remain. Some writers, including the novelist and poet Randolph Stow, have chosen to infer the presence of a higher power in the land- scape and, consequently, in humankind (‘What is God, they say, but a man unwounded in his loneliness?’), others, more fashionably, to answer by way of more mechanistic modes. In this attempt to survey some of the ways in which writers have addressed these questions and contradictions, the definition of ‘landscape’ has been expanded somewhat. ‘A prospect of inland scenery, such as can be taken in at a glance from one point of view’, states the Shorter Oxford. But in Wilderness the concept of ‘landscape’ encompasses the Australian continent’s relative distance and isolation from other Western nations; the facts of its colonial history as determined by its unique geography (which includes its position in Asia and Oceania); the effects of colonial invasion on a previously isolated indigenous population; and, finally, the demography of its urban populations and the way they have formed as a result of that geography. ‘Landscape’ here means Australia’s place in the Southern Hemisphere both as an island—with the relative insularity that that implies—and a continentwith its corresponding potential for cultural and geographical diversity. Though remaining predominantly English-speaking and urban, like their parent-culture, the writers who have produced our literature of landscape were only rarely just undertaking an intellectual and aesthetic survey of the countryside from a book-lined study window, perhaps between jotting notes for a sermon. Romanticism—which has been defined by some as a high development of poetic sensibility towards that which is remote or distant in time and place—gained a foothold only in the rather more modified and mundane form of the bush myth. The idealised and heroic figures of classical art and literature never had a chance to take firm root in Australia because, paradoxically, of a lack of distance, both chronological and real. Where there is little history, there is little myth. Where a society is newly established, it is necessary for most of its members to get their hands dirty. The ghosts of Aboriginal culture were invisible to the European eye. The Australian landscape and the challenges it presented were more immediate in time and space to its writers than the fields of antiquity were to English scholars, and even, in many cases, than the landscaped vistas and tasteful Grecian follies of his park were to that English guardian of culture, the aristocrat. What did become mythologised or romanticised, perhaps, were race memories of distant ‘Home’. The sense of truly belonging somewhere else, like a child’s disconsolate fantasies of being adopted, lingered long after Australian-born generations had established themselves. All Australians, bar the country’s original inhabitants, have at close proximity the sense of inhabiting an alien context. It has been argued both here and elsewhere that the ‘Australian’ character (and consequently its literature) has been formed to some extent by the process of a physical and intellectual grappling with a unique landscape, and one not experienced before by Europeans. While on one hand the development of Australian society could be said to fit predictably enough into the pattern of shifting populations and colonial expansion that has occurred in the last half of the millenium, this is not sufficient in itself to explain the formation of a collective cultural psyche. There have been discernible parallels with the American and Canadian experiences of settlement, and similarities with other emerging post-colonial cultures. But as these other emerging nations differed from each other, according to their various inhabitants and environments, so does Australia from them. And yet, ultimately, however it is defined, we are forced to recognise that the Australian ‘landscape’ is something both less and more than geopolitical factors and deterministic forces, or even psychosexual ones. The Aboriginal idea of landscape has little to do with any of these concepts. It could be argued that a germ of conflict and mystery still inhabits the work of Australia’s writers today, springing from the influence of the continent on the interior landscape of our collective psyche. This impact must be considered when we ask, as a corollary to Stead’s questions, who are ‘we’? And who do we speak for when we attempt these answers? ‘Landscape’, as many poets and novelists would argue, has become a formative concept in the Australian metaphysical dialogue. If there is a soul to the Australian people, then, according to the work of many of the writers surveyed here, it is a soul shaped by landscape.